The Lynden Police Department has a Certified Passenger Safety Technician (CPST) who can assist you with ensuring that your child’s car seat is correctly installed, and also, that your child is properly restrained in the car seat. Please call (360)354-2828 during regular business hours to make an appointment with our CPST. 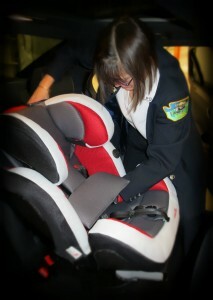 We are happy to help you with your car seat installation and answer questions free of charge. A ticket for failing to properly restrain a child in a vehicle you are driving will cost you $124.00! ALL vehicle occupants to be properly restrained in ALL seating positions. The driver is responsible for seeing that all children under the age of 16 are properly secured. Passengers 16 years of age and older are responsible for themselves and may receive their own ticket if they are not properly restrained. Children under age 13 years old be transported in the back seat “when it is practical to do so”. Children up to their 8th birthday, unless they are 4’9″ tall (57 inches), must be transported in a child restraint system. The restraint system (infant seat, child safety seat, or booster) must be used according to the car seat AND vehicle manufacturers instructions. Vehicles equipped with lap-only seat belts are exempt from the requirements of the booster seat. Children 8 years of age or at least 4’9″ who wear a seat belt must be using it correctly. Do the child’s knees bend comfortably at the edge of the seat without slouching? Does the lap belt stay on the top part of the child’s thigh’s? Is the shoulder belt centered on the chest and shoulder? Can the child stay seated this way for the whole trip? If you say no to ANY of these questions, or if your child puts the shoulder part of the seat belt under their arm or behind their back, your child still needs a booster seat. Review car seat selection appropriate for your chil’d age, size, and review factors affecting proper use. Review the Car Seat Instructions and Vehicle Owner’s Manual with the caregiver and ensure that both are being followed correctly. Ensure that an appropriate seating posittion in the vehicle is being used, especially when using LATCH. Do you feel confident about installing and using the car seat corrrectly?